The Deschutes River originates high in the Cascade mountains from Little Lava Lake. The river carves its path through 250 miles of eastern Oregon before flowing into the Columbia. The 'Lower Deschutes' refers to the hundred mile section from the mouth of the Deschutes to Pelton Dam (near Lake Billy Chinook). The lower river offers a beautiful desert canyon filled with sage brush, osprey, incredible basalt rock formations and plenty of exciting rapids. 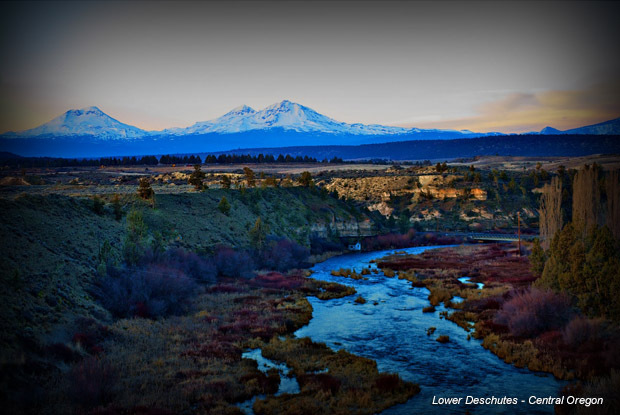 The Deschutes River is one of the most popular rivers in Oregon. There are many attractive features to this section of the river that has made it become so popular. From the warm sunshine, reliable summer water flows, easy access to the numerous fun and exciting rapids that it has to offer, its no wonder that many people travel to this destination. Put In: From US Highway 197 in Tygh Valley turn east onto OR 216 and continue to Sherars Bridge over the Deschutes. Bear left on a paved and dirt road that runs along the right bank. Put in at Buck Hollow or continue down this road to put in at Pine Tree access. Take Out: The Deschutes River State Recreation Area is located just off I-84 between The Dalles and Biggs. This is a very short section of river with only one class III rapid. Wreck Rapids has a clean line down the far river right. The center can also be run but it contains boulders hidden just under the surface of the water. This section is a good start to the 40 mile multi-day trip that ends at the Columbia River. The first 30 miles of this trip is mostly swift moving water, with a few class II rapids, through a very scenic canyon. There are about 60 campsites on either side of the river thought out the run, so camping is not usually a problem. On the last day of the trip you will find the most notable whitewater. Mile 31.5(Washout Rapids): Washout Rapids is a class III rapid that can be run on river right. Look for the power line crossing the river at Stecker Canyon to mark the start of this rapid. Mile 34(Gordon Ridge Rapids): Gordon Ridge Rapids is a class III rapid that starts with a 3 foot shelf. It then continues for another .5 miles. Mile 36(Colorado Rapids): Colorado Rapids is considered to be a class IV rapid because of its potential to flip small rafts. This rapid consists of many large standing waves. Mile 37(Rattlesnake Rapids): Rattlesnake Rapid is class IV and can be scouted from either bank. The river narrows and flows over a ledge. Run this rapid on the left to avoid the hole below. Mile 39(Moody Rapids): Moody Rapid is the last rapid on the Deschutes River. The class II waves quickly stop in the pool were the Deschutes ends at The Dalles Dam. Mile 39.5(Take Out): The take out is on river right at Deschutes River State Recreation Area.